These past several days have been largely occupied with preparing and delivering a conference paper at ‘The Computer Applications and Quantitative Methods in Archaeology’ (CAA) 2012 at the University of Southampton. As mentioned in a previous post, I am researching early Egyptian (and Mesopotamian) image bearing artefact surfaces in order to understand how they were formed and transformed through scribal and artistic activities. 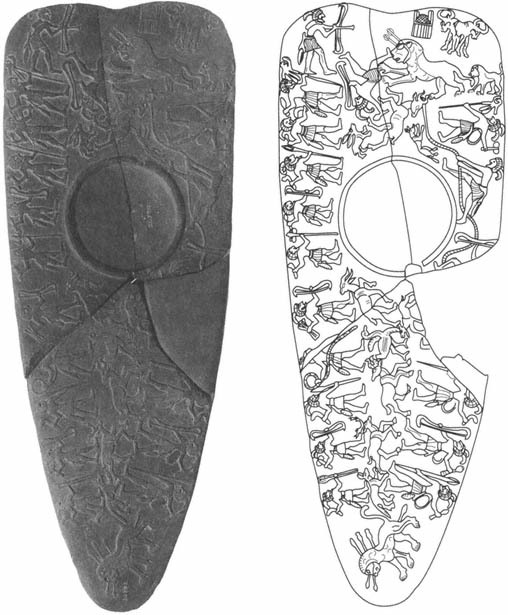 Taking the example of elaborate carving on a Late Predynastic (c.3100BCE) Egyptian mudstone palette, namely the so-called Hunters Palette, I am investigating evidence for its creation through close analysis of the carved surface using Reflectance Transformation Imaging (RTI) data*. Hunter's Palette: relief carved mudstone, said to come from Tell el-Amarna. Photograph © Trustees of the British Museum; drawing from Smith 1949; both from Davis 1992. My aim is to answer questions such as: What tool and carving technique types can be discerned? What stages in surface preparation / carving can be identified? To what extent was the carving planned out prior to execution? This 'diffuse gain' RTI photographic output is a detail of the the lower right side of the upper right palette fragment (above). It shows the 'ghosts' of previous carving and what may be the original path of the rope (indicated by three parallel arrows), and the original position of the hunter's 'tail' (indicated by a horizontal arrow) which is attached to the back of his kilt and abuts the rope (Piquette and MacDonald Forthcoming). In order to visualise the palette’s surface further and characterise these transformations more fully, I’ve teamed up with Lindsay MacDonald, a researcher in Geomatic Engineering at UCL. Using his mathematical and computing expertise (Lindsay specialises in colour imaging, vision science, digital photography and computer graphics) and my raw RTI data (i.e. the series of photographs I took at the BM in late 2010 using the RTISAD project's Oxford RTI lighting dome), Lindsay has been experimenting with new visualisations of the erased/recarved area using different kinds of algorithmic rending or AR (fear not - if mystified, click the link and become de-mystified via a neat and tidy description with examples courtesy of the good folks at Cultural Heritage Imaging!). Depth map of Hunters Palette with section profiles (Piquette and MacDonald Forthcoming). One result of Lindsay's algorithmic rending (AR) work was the depth map, presented above as a grey-scale image. The deepest areas are darkest and the highest are lightest. The red lines indicate the positions of a vertical and a horizontal cross-section. The graphs at the left and bottom show the corresponding elevation profiles (scale in mm). In the vertical section it can be seen that the height drops by about 10mm in the area below the hunter’s rib cage -- possible evidence for recarving that was not apparent from the amalgamated RTI image. 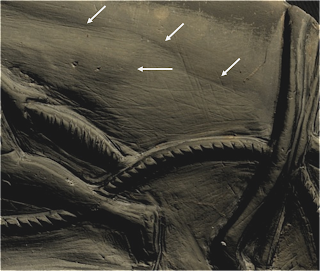 In the horizontal section there can be seen a slight furrow of depth approximately 3mm in the background region above the 'original tail’, further supporting the observation that this area of the surface has been recarved. These and additional results from our collaborative work on the Hunters Palette and its surface transformations formed the topic of our paper at CAA 2012 in Southampton (check out the abstract). 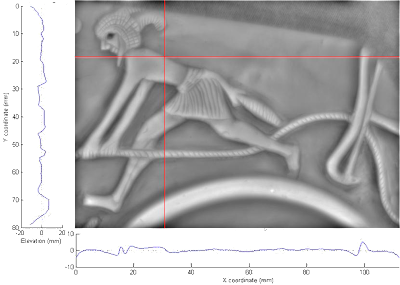 We're now in the process of finalising this piece of research and writing it up for publication, but we have plans to undertake the further study of early Egyptian inscribed and decorated artefacts surfaces using both RTI and AR -- with many exciting results anticipated! * Thanks are due to the British Museum and the Arts and Humanities Research Council’s Digital Equipment and Database Enhancement for Impact (DEDEFI) scheme. ** Not quite clear on what I am describing? You can have a go easily enough using RTIViewer on your PC or Mac. 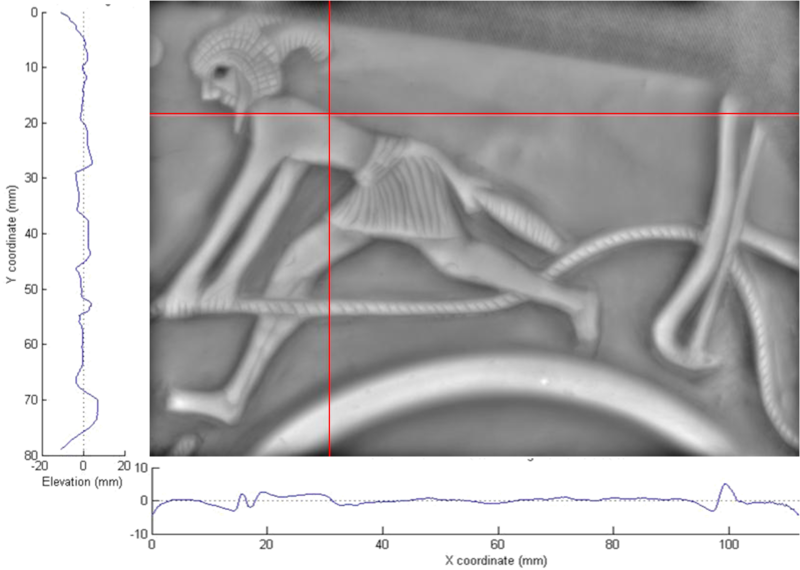 Download the Open Access ( = free) software and 'test drive' it on the papyrus or rock art examples provided. Try it...you'll like it! :-) And then let me know what you think!